Sikkim is one of the finest destinations for Trekking, simply because a trek in this jewel embedded in snow clad mountains provides the most fascinating, charming and awe-inspiring closeup views of the Sikkim mountains. Add to this the richness of culture, tradition and religious spirits, it turns out to be a picture postcard version of ethereal beauty not to be equaled in the whole world. Asst. Director, Sikkim Tourism, SNT Colony, Pradhan Nagar, Siliguri. Chief Secretary, Home Secretary, IGP – Govt. of Sikkim, Gangtok. Passport; photo copy of the front page showing expiry details, and the page where Indian visa is stamped. Specifying the date of entry into Sikkim. *There are no charge for all this. For visiting Pemayangste and Zongri, organised foreign tourists groups consisting of not less than four persons and sponsored by recognised Indian travel agencies are issued permits which are valid for 15 days. The group will be accompanied by a Liasion officer provided by the Govt. of Sikkim. For visiting Tsango Lake and Yumthang, the permit has to be obtained from the permit office in Gangtok. It is issued to a group of four and is valid for a day in case of Tsang lake and 5 day 4 night for Yumthang. Even Indian nationals require an inner line permit to visit Tsongo (Chhangu) lake and Nathu-la pass, which could easily be obtained through operators in Gangtok. Rhodondendron Trek: It’s a fascinating trek, where you traverse at the base of Kanchenjunga (8585 m). It passes through Darjeeling, its tea plantation and on to exciting Goecha La (5500 m) in Sikkim. It’s a 16 days trip, starting with Darjeeling then transfer to Pemayangste and entry into Sikkim via Melli. Important points enroute enroute are : Yuksam,Tsokha,Zongri, Thangsing, lake Samiti, Loecha La, Bakhim and back to Gangtok. It offers a great oppurtunity to walk through tropical and alpine forests where a variety of orchids and rhododendron and primulae carpet the alpine terrain. North Sikkim Trekking Expedition to Green lake : It’s a 14 days trek, taking you to some great scenic beauty and natural treasures of North Sikkim. It passes through : Gangtok, Chungthang, Lachen zema, Jakthang, Pokecchu (3645 m), Green Lake (2918 m) and back to Gangtok. Subline Trek into West Sikkim : It’s a 12-13 days trek around the Kanchenjunga National Bank, starting from Pemayangste and takes you to the naturalist’s paradise : terraced fields of barley, apple orchards, lush green forests of pines fix, magnolias, rhododendrous, spruce and orchids. Add to this the spectacular views of Mt Kanchenjunga, Pandim, Jopone and Narsing Peaks and the trek becomes irrestible for Traveloearth enthusiasts. The trek takes you through : Pemayagste, Yuksom, Bakhim, Zongri (4,030 m), Thangsing, Chemathang (4800 m), Bakhim via Jamlingthang, Tashiding and Legship (520 m). It’s a pilgrimage Trek too and from Legship you can return back to Darjeeling, Gangtok and Kalimpong. Rabongla to Maenam Bhaledunga Trek : Maenam hilltop at 10,600 is just over Rabongla town and the Maenam Wildlife sanctuary lies 3 km away, teeming with magnolia, rhododendron and small bamboos. This 1-2 days trek offers picturesque views from the Maenam Summit, including that of Kanchenjunga range. A 30-40 walk on the ridge leads to Bhalendunga from where you can see Teesta, far dawn, snaking its way through the valley. Tolung Monastery Trek : The monastery built during the reign of Chogyal Chakdor Namgyal (1700-1717), contains vast treasures of scriptures and artefacts which were brought here from other monastery, to save it during Nepalese invasion of late 17th and early 18th century. Tolung lying at an altitude of 8,000 ft, falls in the restricted area for which an inner line permit is required even by Indian nationals Devta Pani, a religious spot can be accessed through an hour long walk along Tolung river. Damthang – Tendong Trek : Another 1-2 day trek. Damthang lies some 15 km from Namchi on the Gangtok – Namchi ( via Temi ) road. Tedong can be accessed through 1-2 hrs trek through dense forest of the Tendong Forest Sanctuary. Tedong (81500 ft) offers peerhaps the best view of the mountain ranges in the state : The Chola range, Singeliha range, Kanchenjunga and Gurudogmar peak and others. Darjeelling, gyalsing, Nathu-La, part of Gangtok and rolling plains of Siliguri can also be seen from here. Do stay to watch the breathtaking spectacle of sunrise and sunset from Tedong. Pelling – Legship Circuit Trek : This is a 4-day trek, linking some interesting villages together in West Sikkim. No separate permit is required by foreign nationals. It takes you to : area around Pemayagste, Khecheopari Lake and Tashiding Gompa and finally to the Legship. Best time : March-May/October-December. Passes through Pemayangste, Snagacholing, Khecheopari lake, Tashiding and Ralang. Tashi View Point to Tinjure Trek : A one day trek from Gangtok. Coronation Trek : Best time : October-December. Passes through Rumtek, Yangang, Rabongla, Tashiding and Yuksom. Hilley Varshey Trek : An exhilarating 2-day trek in West Sikkim takes you to Hilley (9000 ft) and Varshey (over 10000 ft) through Rhododendron forest. Trekking Outfits and Tour operators : Charges range from US $ 25 – US $ 70 per day, depending upon the kind of trek and the operator you opt for. It also offers bird watching and gompa tours as well as White-water rafting. Equipment hire facility is normally available with the tour operators. 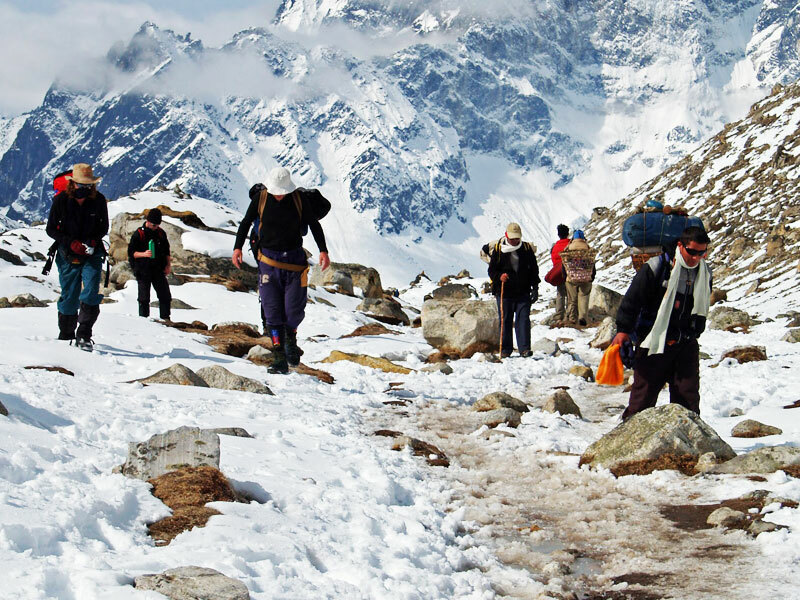 Most of the treks demand a goos physical shape, as the altitude varies from 4000-5000 ft to around 15000 ft. Someone with experience will find it easier. Do have with you a good guide, who other than being familiar with the topography, also knows your language. Invariably, all the camp site have primary / basic health facilities. However, carying one’s own medical kit is a definite advantage. There are certain items which could be hired. e.g. sleeping bags, tents, jackets etc. Others have to be with you. Do caryy light weight trekking shoes, 2-3 pairs of woollen socks, woollen shirts, trousers, windproof jackets, sunburn creams etc. And remember not to litter. It’s against mountain laws and you may end up paying heavy penalties.